The Falling Waters Kayaking Adventure is a guided kayaking tour that takes place on the beautiful Potomac River in Washington County, Maryland. 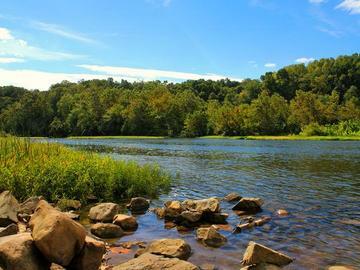 Kayakers on this route will enjoy beautiful views of wooded areas and surrounding farmlands both of Maryland and West Virginia. This route is perfect for skilled kayakers but also navigable for adventure-seeking beginners. We encourage all participants to buy their tickets in advance online through our website. When purchasing tickets online we accept debit or credit cards from Visa, MasterCard, American Express, and Discover. If paying with cash or check(s) please CALL 717-287-9300 to reserve your tickets! Cash or check(s) will be collected at the day of the event. Please bring exact change because we do not carry cash on the bus. If you do not call and reserve your tickets in advance cash or check(s) will be accepted on the day of the event only if there are still seats available on the bus. Ticket prices may be higher when bought in person on the day of the event with cash or check. Seats on the bus fill up fast so purchase your tickets in advance. Once the limited supply of tickets are gone, they’re gone. All individuals joining us on a kayaking tour should be at least 12 years of age. Participants under the age of 18 are required to have a parent/guardian with them to sign the Accident Waiver & Release of Liability Form. Participants younger than the age of 16 are required to have a parent/guardian go along with them on the tour. All kayakers should be physically fit and able to withstand a long duration of consistent light paddling. Our kayaks have the capacity to hold individuals weighing less than 275 lbs. Kayakers should know the basics of swimming. Conoco Kayak, LLC advises all participants to wear the provided life jackets at all times. Conoco Kayak, LLC kayaking tours can be very adventurous even though they’re flat water tours. There may be challenging obstacles along the way that you will encounter. Periods of sitting in one position for an extended amount of time are expected while kayaking with Conoco Kayak, LLC.